Yesterday Tuesday 16th of January 2018 marked seven days I left #Portharcourt prison. Been doing outdoor therapy as instructed by my psychotherapist. Venturing out safely into neighborhoods which I’ve been doing as part of my treatment of depression. I normally go to 3 pm prayers at the Catholic church down the street to get spiritual energy. Last night, I decided to go to New GRA to worship at #Salvationministries Headquarter. I walked into the kingdom of God like no other. This church was very different. I was lifted! They were having 4.30pm prayers after a 21 day fast. I joined them in an energized service in a God-anointed mega church. I ate communion and drank wine. The Lord was everywhere! After prayer service, I asked security personnel to meet Pastor Ibiyeomie privately in his office to pray for me. The men in black suits took me to a waiting room and then asked me to come in. There were five pastors in the room watching. Two were my prosecuting lawyers; then I walked up to him telling him I was the one he locked up in prison! I knelt down, and he grabbed my hands. Suddenly my all day asthma wheezing and migraine vanished! He had divine powers of some kind. He prayed for me, told me he had FORGIVEN ME a long time ago and repeated it in front of me again. I told him I was not bitter and have forgiven him too. I have decided to serve God, and it will be through Salvation Ministries and him. He Also invited me for his #5NOG five nights of glory. He says miracles happen during that week. My miracles started last night. I will give my compelling TESTIMONY soon. I am never leaving PH again. I begin serving the Lord here working in his church and will stoop to conquer flying my flags with Jesus here at Salvation Ministries. The Home of Success! See you next week at 5 NIGHTS OF GLORY!! Isn’t God wonderful? 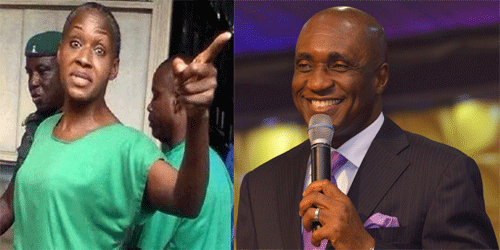 0 responses on "Kemi Olunloyo Reconciles With Pastor David Ibiyeomie; Attends Salvation Ministries"